It's a tough life being an armoured camera; your chunky, flight case-like exterior invites careless owners. Announced alongside the 16 megapixel Panasonic FT20 comes the 12.1MP Panasonic FT4. Confusingly, despite the lower headline resolution, the Panasonic Lumix DMC-FT4 has the tougher attributes. It's water resistant to a depth of 12 metres, which is twice that of most rivals and well above the FT20's 5m. It's also able to withstand drops from 2m, rather than the FT20's 1.5m. 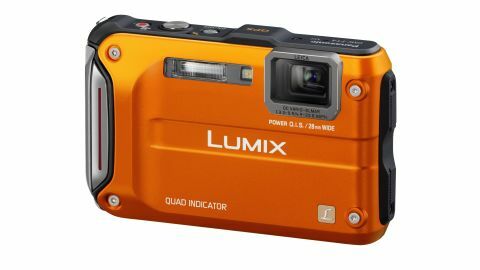 But, Panasonic says that if the Lumix FT4 is dropped too often, this may affect the effectiveness of the waterproofing. The FT4 is additionally freezeproof to -10°C and dustproof. Current competitors among rugged compact cameras include the Olympus TG-320, Fuji XP50, Canon D20 and Nikon AW100. Despite the workhorse exterior, complete with Bob the Builder screws in the four corners of its faceplate, rubber padding and reinforced glass protecting the internally stacked lens, Panasonic's point and shoot camera isn't a professional tool. Active families (including those with inquisitive toddlers), adrenaline junkies and holidaymakers are the target audience here. Although the toughened qualities are what you'll inevitably be paying a premium for, they're not the full story. The more you drill into the feature set, the more the Panasonic FT4 reveals itself as a potential Swiss Army knife of digital compact cameras. Indicated by the small hump on the top plate, it comes with integral GPS antenna with over a million place names stored. It was able to pinpoint our local district rather than just the general borough, picking up a signal both indoors and out, which isn't always the case. Plus, for more adventurous types, the Panasonic Lumix DMC-FT4 packs in a compass, altimeter and barometer. Add in the now ubiquitous Full HD video, with choice of AVCHD or MP4 formats and a dedicated button for recording, plus software-enhanced 3D stills capture, miniature digital filter effect, auto, manual and intelligent auto capture, and you have a high-end feature set. The price is also towards the top end, however, costing £350 in the UK or $400 in the US, where it's called the Panasonic Lumix DMC-TS4. This could almost buy an entry-level DSLR. So, given the above, is the 4, um, fantastic?